Author: Wilhelm J.G. Möhlig, Lutz Marten, Jekura Uaurika Kavari. Series edited by: Wilhelm J.G. Möhlig, Bernd Heine. Herero is a Bantu language (G.31) that is spoken mainly in Namibia and parts of Botswana and Angola. 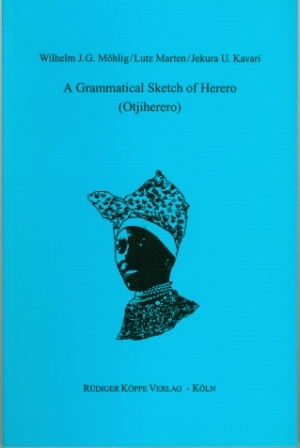 The present grammatical sketch of Herero (Otjiherero) contains a concise but complete grammar of the Herero language of Namibia. All aspects of language structure are covered, in particular phonology, tonology, morphology, syntax and lexicon. Two elaborate text examples are included. Because of the limited size tables and paradigms prevail. An index allows quick access to topics beyond the traditional structure of a grammar. The intention of the book is two-fold. It offers a reliable aid for those interested in gaining a practical language proficiency in Herero, while for Herero native speakers it provides a good access to the English language. The study is the result of a collaborative research designed as a European-African partnership project by three bantuists where one of them, Jekura U. Kavari, is a native speaker of Herero. We in Africa need more of this type of accessible grammatical sketches of our languages!